Elders at home, in assisted living, and nursing homes are at risk for injury because of decreased vision. Visual problems run the gamut from reliance on glasses to legal blindness. Legal blindness is defined as corrected visual acuity in the better eye of 20/200 or worse or as vision restricted to 20 diopters in its widest diameter. Three percent of persons over the age of eighty-five in the United States are legally blind; approximately 25 percent of nursing home residents are legally blind. Blindness is caused by diabetes, glaucoma, hypertension, trauma, and arteriosclerosis. Decreased ability to accommodate is often the first visual change, which affects the ability to focus clearly over distances or to read and then see clearly at a distance. People experiencing this problem need prescription changes or “longer arms” to be able to read. A smaller pupil requires more light. An older person needs approximately three times as much light as a twenty-year-old needs. Moving out of a darkened room into bright light causes difficulty because the older eye adapts more slowly to changes in illumination. Visual changes such as this increase the risk of injury for elders coming out of restaurants or darkened theaters or moving from a darkened bedroom Into a bathroom. Color and depth perception are affected by the normal yellowing of the lens of the eye. This affects the ability to judge distances. Reds, oranges, and yellows are easier for the elder to distinguish than blues and greens. Pinks and beiges may be difficult to distinguish. Elders need strong, bright contrasting colors. They may be unable to follow simple color codes. * Use night lights in bathroom and bedroom. * Avoid highly buffed floors that reflect overhead light with the glare. * Provide large print room door tags with the resident’s name and room number. * Use a high contrast color on the edges of steps. * Keep clothes and objects in the resident’s room in the same positions. * Keep food and utensils in the same places on the tray. * Create lighting within the facility that is consistent, evenly distributed, and of adequate intensity. * Place fluorescent or brightly colored tape around outlets, light switches, and doorknobs. * Provide cups and glasses with contrasting rims. * Place light objects on dark surfaces and vice versa. * Monitor for signs and symptoms of dry eyes. * Mark resident’s glasses with the resident’s name. * Encourage routine annual eye exams. 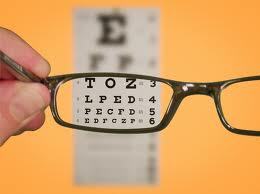 * Provide eyeglasses or recognize the need for change in prescription. * Inquire about eye pain. * Report signs of eye infections. * Keep commonly used objects within reach of resident so searching and stretching to reach something will not be needed. * Provide a safe environment. Sources: Ouslander, J., D. Osterweil, and J. Morley, Medical Care in the Nursing Home, Second Edition, New York: McGraw Hill, 1997. Stanley, M. and P. Beare, Gerontological Nursing, Philadelphia: F. A. Davis Company, 1995. Adapted from Sensitizing People to the Processes of Aging: The In-Service Educator’s Guide by M. Ernst and H. Shore. Dallas Geriatric Research Institute, 1977. Distributed by: Judith L. Warren, Ph.D., Extension Program Leader and Professor and Extension Gerontology Specialist, Family Development and Resource Management, Texas Cooperative Extension, Texas A&M University, College Station, Texas. 1995.